Ember Spirit (Xin) was based off the Fire Panda aspect of the Pandaren Brewmaster, Chen Stormstout. In the World of Warcraft, the Pandaren are a secretive race who long ago left Kalimdor when they saw the Night Elves' obsession with magic and the troubles it would bring. They only formally resumed contact with the Alliance and the Horde after the Sundering. In the Warcraft 3 storyline, a wandering Brewmaster - Chen Stormstout - meets Rexxar in the Barrens, and they both play a key role in the narrative of the Orcs landing in Kalimdor. In DOTA2, the Ember Spirit is part of a trio of elemental spirits - Storm Spirit (Int), Earth Spirit (Str) and Ember Spirit (Agi). What they all have in common is very high mobility, which makes them hard to kill, and also gives them great reach, allowing them to catch up to enemy heroes even from tremendous distances. 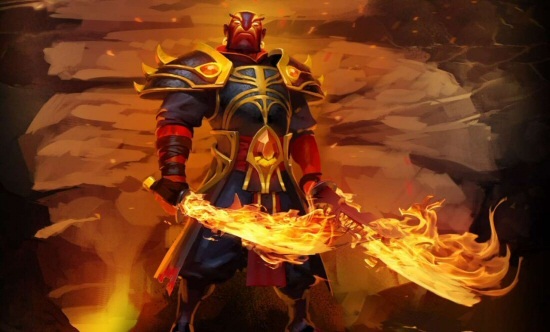 The Ember Spirit's playstyle revolves around using Sleight of Fist and Fire Remnant to zip around the battlefield, allowing him to completely dodge enemy spells and land Searing Chains (a 3 second immobilize) on fleeing enemies. In the early game, his Flame Guard makes him a dangerous opponent, as it burns nearby enemies and also protects him from magical damage: support heroes getting dived by an Ember Spirit can often do nothing but burn slowly to death. At present time he has a 43% public win rate (from DOTABUFF) after receiving a series of nerfs since his introduction. Xin's skill set is almost item independent - allowing him to contribute to teamfights with a bare minimum of items. This allows him to play almost any position in any lane. Unlike most jack of all trade heroes, his Sleight of Fist has incredible scaling with damage items in the late game. Xin is also very difficult to pin down and kill. He contributes to teamfights from extreme range without putting himself in danger, and he can escape danger instantly by teleporting to a Fire Remnant. He has poor stat gain and thus can be killed easily if initiated upon. Landing his primary disable - the Sleight of Fist and Searing Chains combo - can be unreliable - more on this later. This is going to be a much longer post than usual, because this hero has a lot of issues worth mentioning. Searing Chains ensnares two random enemies within a 400 radius, so with careful positioning you can try to avoid wasting this skill on creeps. Sleight of Fist has a 700 cast range, and will allow you to hit anything within 550 radius of the cast point, potentially allowing you to strike at targets 1250 away from you. Each target will be attacked in sequence, one target every 0.2 seconds, and finally you end up back where you started. You are invulnerable during the attack animation. The length of the green line is the 700 cast range of Sleight of Fist. The blue circle shows the 550 radius AOE covered by it. The picture above was taken with the range finder active - it's disabled by default. The range finder shows a solid green line (like above) if it's within range, and a faded green line with a red portion showing how far you have to walk before it activates, but I personally don't use it - it feels like using intuition is superior to trying to pay attention to a rangefinder. All you have to know is that the blue circle can be a bit further away from your character, but not by much. To enable the range finder, you can manually enter the console command dota_disable_range_finder 0 but you'll have to do that every game. To set it permanently, you need to edit the DOTA2 launch options to look like above. Setting -novid gets rid of the silly intro Valve animation (with the bald guy) and -console enables the console, they're not necessary for this but it's nice to have. Anything after the + sign gets entered into the console. The obvious synergy is to use Searing Chains during the Sleight of Fist animation on targets that are far away from you. Say an enemy is 1000 distance away: you can cast Sleight of Fist, and then immediately - during the 0.2 second slashing animation - cast Searing Chains. The ability to reliably land a 3 second immobilize and at least 500 damage on an enemy 1000 distance away - for only 160 mana - is major part of what makes Xin so powerful, but also requires impeccable timing. This ability can even hit and immobilize enemies hidden in fog - as a bonus, the immobilize effect will cancel teleports, making escaping from Xin an almost fruitless exercise. All of Xin's abilities have no casting animation. This is an important fact because this allows you to easily dodge spells and attacks using a well timed Sleight of Fist, or even Fire Remnant. Dodging a spell with Sleight of Fist to score First Blood. Dodging a spell with Fire Remnant to avoid death. When Searing Chains and Sleight of Fist are maxed, Xin's playstyle revolves around hanging back at the edge of the battlefield, using the Sleight of Fist and Searing Chains combo every 8 seconds to deal heavy damage and proc the immobilize effect on his enemies. Only when the enemies are close to death or fleeing does Xin charge into the fight with Fire Remnant to finish them off. This is an extremely situational skill. Flame Guard burns enemies in a 400 radius and also absorbs magic damage directed at Xin - if the shield absorb gets used up, the burn effect disappears too. At level 3, Xin can have two points of Flame Guard, which deals 40 damage of burn damage per second in a 400 radius, and absorbs 200 points of magic damage. Used correctly in conjunction with 1 point in Searing Chains will make you a strong contender for first blood, especially with allies who can synergize with your 2 second disable - but it all depends on the type of opponents you are facing. A pair of magic nukers can instantly dispel your shield, leaving you vulnerable and stunned / slowed in melee range, while pure physical damage users can ignore your shield and kill you faster than you kill them. However, taking two points early is be detrimental to your mid game, as a lot of Xin's effectiveness only comes online once he maxes Sleight of Fist and Searing Chains, which he usually does at level 9 (4-4-0-1). Flame Guard is quite inefficient at 2 points - consumes a lot of mana for not much benefit - but maxing it delays your core skills even more. You either end up with 2 useless skill points at level 11, or you delay your full effectiveness until level 13. Generally if you can avoid it, don't take Flame Guard, unless you have a very favourable lane matchup for it. As the burn range of Flame Guard is identical to Searing Chains, it can serve as a useful indicator as to whether the enemy is in range of Searing Chains - you can see the burning animation on them if they're taking damage. Most of Xin's strategic playstyle revolves around careful pre-placement of Fire Remnants. You store 1 Fire Remnant every 35 seconds, and placing it on the ground leaves it there for 45 seconds. You can click to dash to any Remnant - if there are multiple Remnants on the map, you will dash through each of the others before arriving at your destination. Each Remnant then explodes, dealing AOE damage. Usage of this skill requires deliberate forethought. 1. Escape Mechanism - you always want to leave a Remnant in a safe spot you can instantly retreat to if you get ganked. However, it only lasts for 45 seconds, and it's easy to get caught out without one. 2. In Combat Mobility - you can use it during fights to reposition yourself, either to move away or towards the battle. The Fire Remnant itself can be targeted at 1500 distance, and it runs there at 2.5x of your current movespeed (typically, you have 360 speed with brown boots, which equates to 900 speed for your Fire Remnant) . You on the other hand, travel to it within 0.4 seconds, or at 1300 speed if that's faster. This means that if you cast a Fire Remnant and immediately dash towards it, you'll catch up to it and detonate it before it reaches its original destination, which can prove disastrous if you were trying to use it to get up / down a cliff. Also bear in mind that the Fire Remnant is affected by slows - if you are crippled by slow effects, escaping with a Fire Remnant will be difficult as it also travels slowly. As an example, if you had 360 move speed, and cast the Fire Remnant at the max 1500 distance, it would take 1.7 seconds for it to get there. In order for you to actually arrive at the Fire Remnant at its correct range, you would need to give the Fire Remnant a 1.3 seconds head start before dashing towards it. (in other terms, the Fire Remnant needs to travel 1140 distance out of 1500 distance, or take 1.3 seconds out of 1.7 seconds move time). If you're under attack, you can use Sleight of Fist to make yourself invulnerable while waiting for the Fire Remnant to travel the required distance. This is very similar to Puck's waiting time when using Illusory Orb to escape. 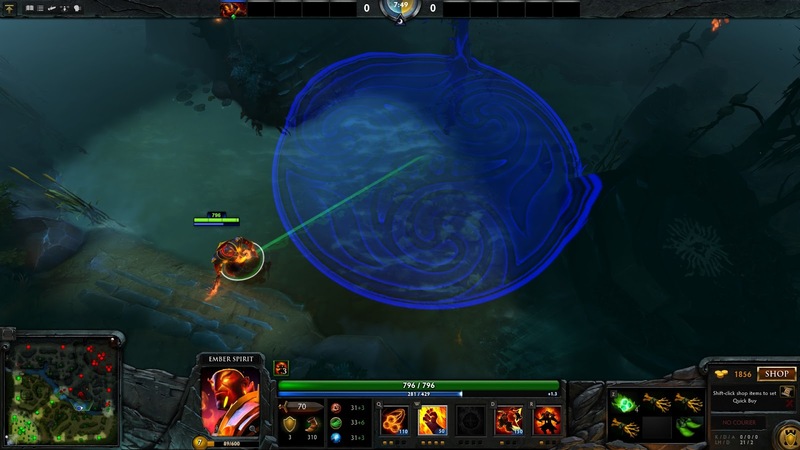 Puck uses Phase Shift to avoid damage while waiting for the Orb to travel a sufficient distance. 3. Rune Control and Bottle Recharging - If played mid, Xin can make good use of the bottle. When he's on low HP / MP and his bottle is empty, he can place a Fire Remnant, teleport home, quickly regenerate to full and refill his bottle before dashing back to his Fire Remnant. This can allow him to rejoin an ongoing fight fully recharged - the downtime isn't much of an issue, considering the 8 second cycle window of his Sleight of Fist and Searing Chains combo. In this way he's a bit like Tinker, able to leave and rejoin an ongoing battle fully healed. In any case, ANY time you want to go back to the fountain to heal you should place a Fire Remnant in the field so you can quickly return after healing if you want. He can also control the runes by placing a Fire Remnant on the rune spot 30 seconds before it spawns. Fire Remnants are also useful for taking shortcuts across the map, especially so when jungling. 4. Burst Damage - if there's a particularly good opportunity you can level up Fire Remnants to use them as burst damage - as there's no casting animation, if your team manages to catch a few enemies in a group you can unleash all three remnants and detonate them for 600 points of AOE damage. 5. Defend against split push - Let's say your team is pushing their tower and wants to force a teamfight, the enemy sends one or two heroes to counter-push another tower in response - you can leave a Fire Remnant behind, teleport back to your tower to defend, then dash back if a teamfight starts. This gives Xin some pseudo global presence like Furion / Spectre / Morphling. 6. Provide Vision - the Fire Remnants have 400 vision range, so you can use them to scout or provide vision of incoming ganks. Here's a quick clip showing the usage of Fire Remnant and the Sleight of Fist + Searing Chains combo, where the Ember Spirit easily catches up to a fleeing Naga Siren even though she uses her Song of the Siren to escape. Battlefury is a standard item on Xin, allowing Sleight of Fist to cleave, multiplying the damage on targets close together. It has great synergy with teammates abilities that cause the enemy to clump up, for example Magnus and Dark Seer, or enemy abilities that generate lots of summon units or illusions. Xin is easily picked off and killed by heroes with long range initiation, such as Storm Spirit. Enemy team composition that is mainly ranged will be able to avoid grouping up and render his Sleight of Fist and Searing Chains less effective. Bottle is a standout item for the early game, as Xin's regeneration is poor. A full bottle will restore 405 health and 210 mana. Compared to a Perseverance, which grants roughly 2 mana per second (if built as first item) - it will take 105 seconds to restore as much mana as a full bottle does, at 1/3 the cost. Xin makes good use of the bottle because of his ability to effectively scout and get runes with Fire Remnant (although dashing to the remnant uses up 150 mana itself, barely paying for itself) but more importantly because he can make more liberal use of teleport scrolls or walking home - he can leave a remnant in the lane before walking / teleporting home and immediately dash back out into the field. This gives far more opportunities to refill his bottle compared to other heroes. This also means that Boots of Travels is a viable first item for him - as Xin is relatively item independent, he can afford to buy this as a first item so he can heal and refill his bottle at will. Battlefury is Xin's core DPS item, due to the way it interacts with Sleight of Fist - every target in the area gets hit by a single attack, which means that any one target might be in range of multiple cleaves, increasing damage taken exponentially. The item is also ideal because it provides raw damage (Xin doesn't need attack speed) and also provides much needed mana regeneration. Note on cleave mechanics: notionally it's 35% of your raw attack damage, but because it's unreduced by armor or evasion it typically ends up as roughly 50% of your normal attack. The radius of the cleave is 250, so it ends up a rather large circle 500 distance in diameter - this is larger than the typical AOE stun radius used in the game (225 radius, for the AOE stuns that Lina, Leshrac and Sven have). So, larger than you might have imagined - try envisioning one circle of AOE damage like that for every target hit by your Sleight of Fist. Non hero units take half damage from Sleight of Fist and so the cleave damage is reduced accordingly. There's several standard builds on Xin, depending on which orb effect you want to utilize. Brown Boots into Drums of Endurance, then Battlefury - this is the high DPS build that is the most common. If you're feeling confident you can skip the Drums of Endurance, as it's just there to provide a bit of a HP and MP buffer for safety. If there's a ganker targeting you, you need to take countermeasures: if it's an invisible hero you need to carry a gem, if it's a long range initiator (blink LC or SS) then you need Linkens late game. Brown Boots into Eye of Skadi, then Battlefury - this build is more early game ganking oriented, with a Point booster and very useful Orb of Venom early on. Applying the Skadi debuff (35% move and attack speed slow, goes through BKB, 5 seconds duration) on the entire enemy team will yield a large advantage in the mid-game fights, as well as giving you a very large health and mana pool. The Skadi debuff duration (5 seconds) nearly matches Sleight of Fist's cooldown (6 seconds) allowing you to kite enemies to death - this is a key feature of Xin's playstyle, as he can not stand up to and trade blows with the enemy carry. This is my preferred build by far. Arcane Boots into Desolator - This is an alternative non-Battlefury build, where you build Arcane Boots to compensate for the lack of mana regen. This could be a good choice where the normal Battlefury cleave is unlikely to be useful and you prefer to apply the -7 armor effect to the whole enemy team. For example, an enemy team that has no summons or illusions, has mostly ranged heroes, your own team is mostly physical DPS and lacks a way to force the enemy to clump up. Either stacking multiple Battlefuries and / or getting a Divine Rapier is the common "end game" plan for him. Maelstrom is currently bugged (?) on him in that a second proc will not occur while the first is still chaining, limiting its viability on him. In any case, there is a lot of item-budget wasted on attack speed which makes it sub-optimal. Shadowblade is possibly bugged (?) on him right now where if he activates Shadowblade's active, then casts Sleight of Fist within the 0.3 seconds fade time, all targets hit during Sleight of Fist receive the 150 damage bonus from the Shadowblade active. In addition, once Sleight of Fist is finished, you will remain stealthed, and upon breaking stealth you still get that 150 bonus damage attack. It may be viable as a second damage item after the first Battlefury, due to the mana costs involved, but I don't really recommend it.